Log onto a server and open a command prompt as Administrator. Issue the following dsquery to create a four column, comma separated text file of all users names, logon names, primary object SID and if applicable, sidHistory SID. Then open this .csv file in Excel and Auto Filter the sidHistory column to show all blanks. This is the list of accounts that have NOT been subject to an inter-domain user account migration. Users Home Directories are often hardened such that even Domain Administrators have problems migrating them and subsequently deleting them. A way to deal with that is already documented here so this post is really just about the subsequent cleanup of the stubborn source data. You can sit in Windows Explorer taking ownership and rattling the new permissions down each users tree if you like, but it’s a laborious process when you have 2000 users. It doesn’t always work out 100% successful either. This is my way of clearing out all users home directories that begin with the characters u5 for example. You can adapt or scale it up it to suit your own requirements easily and save yourself a lot of time and effort. First, make a list of the directories you want to delete. Whether you have access to them or not is irrelevant at this stage. Create an empty folder if you dont have one already. This will leave empty folders behind but the security on them will have been overwritten with that of your empty folder, giving you the permission to delete it. Note: Use /TIMFIX with /B to correct non-copying of datestamps on files, resulting in 02/01/1980 datestamps on all files copied with /B Backup rights. There’s nothing more frustrating than downloading an installer that assumes that you’re going to have internet access on the machine that you subsequently intend to run the installer on (called a stub installer). For example, downloading firefox so that you can get to your enterprise storage arrays java based admin interface without the agony presented by internet explorer’s tendency to throw its toys out the pram over the certificate and the settings are locked down by IE policy, this policy, that policy and the other policy that all exist to make the environment so much more “secure” but actually just don’t allow anything, anywhere, ever. It’s secure!, it’s been signed off as being suitably unusable to prevent exposing ourselves to any kind of imaginary threat! Aren’t we clever?. No. Rant over. It’s secure!, it’s been signed off as being suitably unusable to prevent exposing ourselves to any kind of imaginary threat! I’ve probably digressed, I can’t tell. I’m too angry. And you are too probably, if you’ve ended up here. Installers that assume an internet connection are completely useless in the enterprise environment (best read in the voice of Clarkson). Whats even more frustrating is that the stub installer is the only apparent option, judging by mozillas website. Well it isn’t the only option – you can still download the full-fat, stand-alone installer from their ftp site – but ftp is blocked by your firewall! No bother, just replace ftp:// with http:// at the beginning of the URL, or even better just click here for the 64 bit version (or here for the 32 bit version). When viewing a mounted shared filesystem that contains users home directories, many of the folders will be displayed in Windows Explorer as “My Documents” instead of the logon name e.g. bloggsj. When you’re looking for a particular users home directory and they’re all called “My Documents” it can get quite frustrating. This occurs as a result of the users home directory containing a desktop.ini file and your windows client is designed to automatically assume you’re looking at your own home directory. It’s basically not smart enough to figure out it’s not yours but somebody elses. You’d think they’d patch this but they haven’t yet and it’s been this way now for years. So, what to do (other than use command line to do everything)? You then get an extra column showing the real filename that will totally overcome the problem and give you the visibility you want. You could make this the default for folders by doing this. If you’re tasked with generating a list / creating a spreadsheet of all user accounts in AD but are worried you might miss out an OU when manually going through and exporting the list using the Active Directory Users and Computers MMC Snap-in, then use Powershell to generate a list instead, safe in the knowledge it’ll find everything. If you’re really keen you can subsequently use GNUWin32 to give you neat command line tools usually only available to a bash command prompt on a Linux/UNIX OS to chop columns out of the exported csv file using cut, awk, sort and uniq. Or just use Excel to achieve it. More on GNUWin32 here. Some other useful Labels you may want to use are shown below for your convenience (including a neat If statement for extracting Disabled Accounts). I had some trouble with the LastLogon Label, so have included the working example used to obtain this information below. What groups am I a member of? 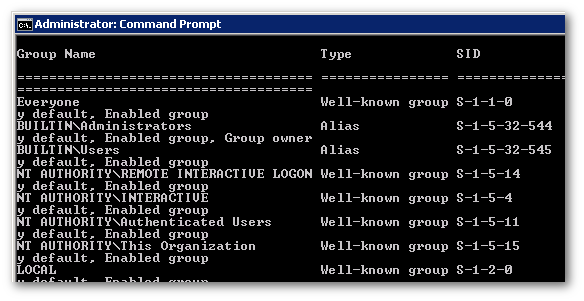 Need to know what groups you’re a member of in Active Directory, but don’t have access to AD Users and Groups management snap-in? Try this command. It may help to run cmd.exe as Administrator if that privilege is available to you, but may not be necessary. The output at the bottom will be something like this, along with any additional Global group names you’re a member of. Note: whoami also works on Linux/UNIX systems. 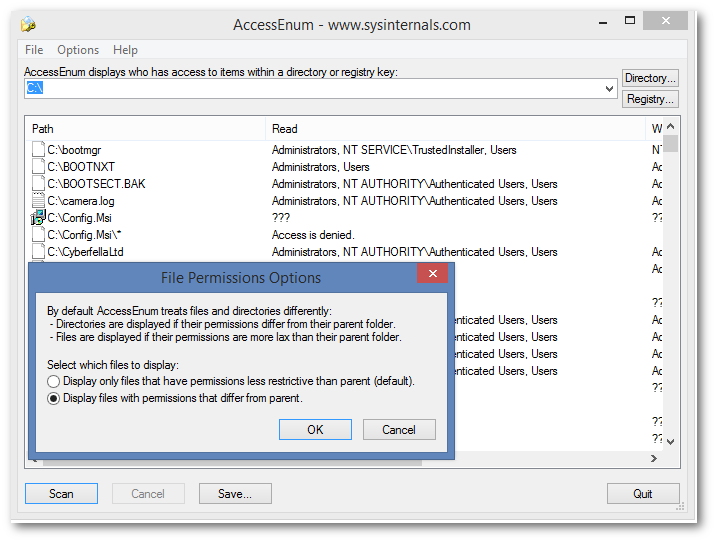 Inject Administrators/Full Control permissions into inaccessible folders. Note: This can also be used to inject Everyone/Full Control, or a specific user, using the username or SID. The Administrators Group SID is always S-1-5-32-544. Other well-known SIDs are listed here. Download the command line version of SetACL.exe from here. Like all the best things in life, it’s free. The following command gives Administrators the “dream ticket” to accessing all data by setting ownership to Administrators on all folders and files and forcing subdirectories to re-inherit inheritable Administrators:Full Control permissions from the parent. If you still receive “Operating System Message:Access Denied” or similar, then you’ll need to take a robocopy of the “inaccessible” data using the /B switch to exploit OS Backup Right, leaving permissions behind using /COPY:DAT (instead of /COPY:DATSOU or /COPYALL) then repeat the process above on the copied data instead. Now view the Inherited permissions on the copied data… You’ll see it has a whole bunch of new, open permissions that it’s got from the parent folder T:. The cracked data could be robocopied back over the original inaccessible source data using /MIR /COPYALL /SEC /SECFIX switches if required. If it doesn’t allow it, then note that I have successfully robocopied an empty folder over the top of an inaccessible folder before using just /MIR (in order to delete it), then robocopied the cracked data back into place, e.g. Presently, access has been attained via inherited permissions so before removing inheritance, first inject a non-inherited ACE that allows administrators access, i.e. After migrating Windows data, it can be a royal pain cleaning up the source data using del *. * /s /q /f, especially when the path length exceeds 260 (or thereabouts) characters. You can manually shorten the folder names and keep trying, but this may be time consuming, tiring and ultimately futile. The simplest way I’ve found to reliably delete data, irrespective of path length, is to use robocopy. repeat for each adjacent folder, 2, 3, 4 etc. Robocopy leaves some NTFS permissions behind? Googling doesn’t help – every solution that promises to work, doesn’t. ALWAYS USE THE /B SWITCH! Sorry for shouting, but I’m really rather excited to have cracked this major show stopper for my clients data migration. The /B switch uses the Backup right to perform the copy. That’s presumably running with system level privs, rather than my meager admin account in cmd run as administrator. Magic. Data integrity restored! Professional reputation saved! All users would have to have access to the top level share, then all users might still have access to the Human Resources, Payroll and Pensions folders too. 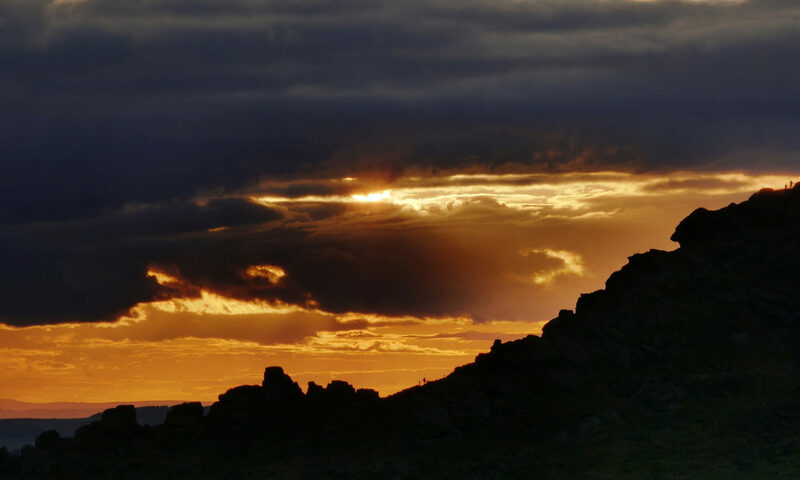 There may or may not be a cost centre folder to aid the business in understanding what parts of what department are consuming the most storage space (for internal billing), then there will be the “parent” folders (top level in terms of the point where specific permissions are set) whereby only certain individuals in a global group will have access. ABE (Access Based Enumeration) might be enabled also, preventing users who don’t have access to certain folders from even seeing that the folder exists in the first place. For the purposes of data migration and reporting, the IT department should have some kind of data admins global group that has full control from the top, all the way down. Backup admins will also need modify access in order to perform file recoveries back to their original locations. Over time, chunks of data get moved about as a result of departmental “tidy ups” and restructuring. The effect this has on permissions is that when data is “copied” it inherits the security of the parent folders on the destination side, however when it is “moved” it takes its permissions with it – sort of. I say “sort-of” because although it takes the security ACE’s with it, it also takes the attribute that says those ACE’s were originally inherited from the parent. I say “sort-of” because although it takes the security ACE’s with it, it also takes the attribute that says those ACE’s were originally inherited from the parent. And therein lies a problem for subsequent data migrations. The effect this has, is to cause the folders on the migrated side (where a copy operation has been used) to subsequently re-inherit their permissions from their new parent. Only non inherited permissions and inheritance attributes are ever copied, so these permissions that were once inherited but can no longer be inherited are likened to “ghosts” and are lost during any kind of copy operation (data migration operation using emcopy/robocopy or some other method). I’d like to use “orphans” to describe these children with no matching parent permissions but the term is already taken to describe SIDs in ACEs that no longer resolve to a group in AD (occurs when a folder is secured then the group subsequently deleted), so I’ve come up with “ghosts” to describe them. I can’t use “zombies” as that is taken to refer to a child process on a UNIX system that has completed execution but remains in the process table so until its parent process can read its exit status. “Ghosts” is quite apt as they are not tangible and vanish when you migrate the data. Technically, the copy operation is correcting anomalies but in the real world, that means loss of access, or worse, open access, depending on the nature of the change of permissions on the new parent. The best way to deal with these ghosts is at source, but you need to know about them first, in order to deal with them. Sysinternals accessenum GUI tool is a neat way to scan filesystems looking for children where the security differs from that of its parent. Be sure to set the options accordingly.